With the first pedal stroke came that odd feeling where the future suddenly becomes the present. I had stared at my National Geographic map and Google Earth for so many months that I almost couldn’t take it anymore. I’d read several accounts of other people’s trips on this route. 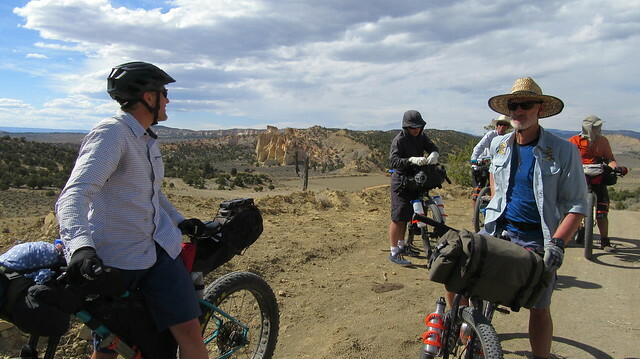 It took six months to get to this moment, and now here we were, 9 of us riding off into Grand Staircase-Escalante National Monument for five days of off-the-grid bikepacking adventure! The idea for this ride was hatched back in November. 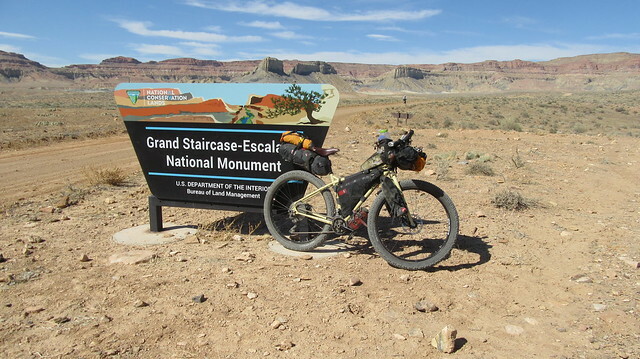 We picked the Grand Staircase Loop in southern Utah off bikepacking.com. 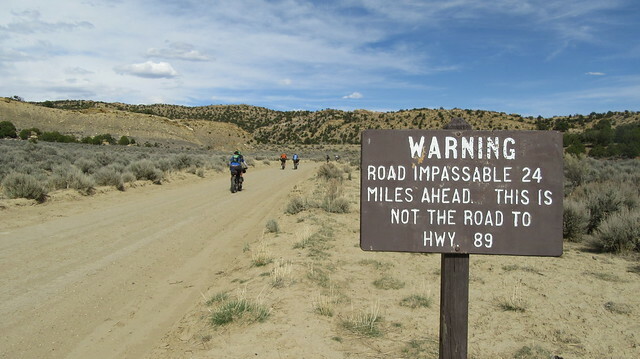 At 160 miles with a moderate difficulty rating, this route seemed to be within the realm of our abilities, but also long enough to make the long drive to Utah worth the effort. 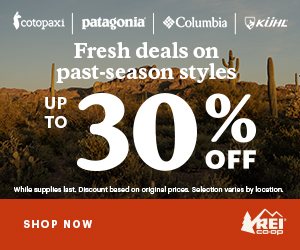 Over the months we exchanged hundreds of emails, met over beers, and purchased a lot more gear (and even a few bikes). 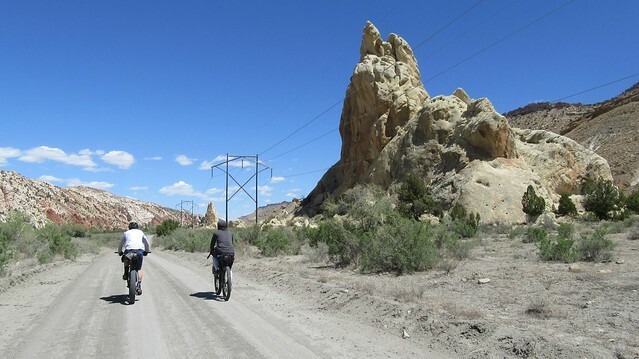 My family and I did some recon of the Cottonwood Road segment of the route while we were in the area over Spring Break. The main thing I took away from that drive through the National Monument was that water was going to be an issue. 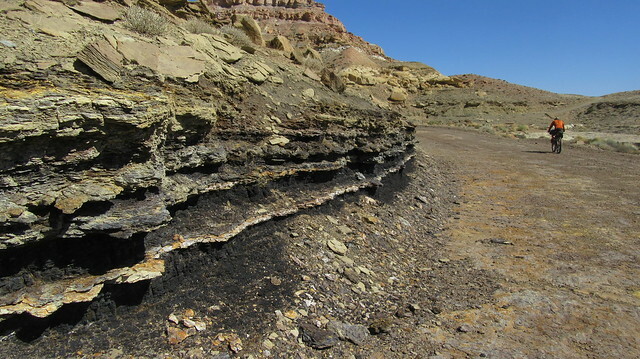 The most reliable water sources had signs of cattle everywhere, and other possible sources were already dried up! With water now being our number one concern, one of our riders heroically left a day early and stashed several gallons of water at two locations along the route. 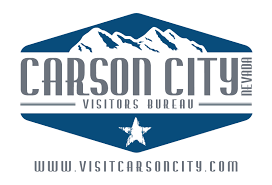 Due to the logistics of coordinating 9 riders, we didn’t leave Carson City until a Saturday afternoon. We got to Tonopah just as the sun was setting, but still wanted to get a couple more hours of driving in. We made it to Tikaboo Valley just off the Extraterrestrial Highway, not far from the mysterious AREA 51. 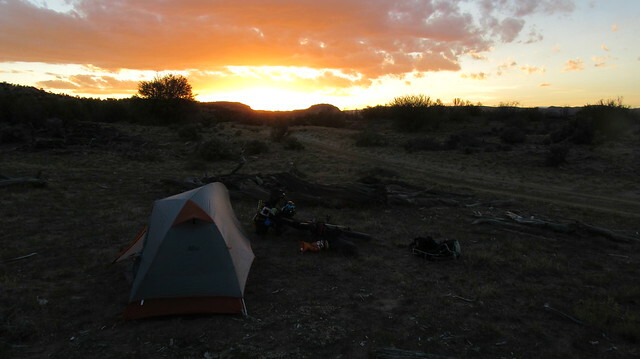 We setup camp in the dark, then opened a few beers and watched the night sky. 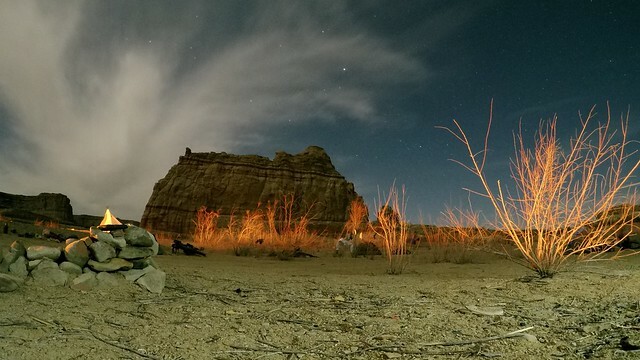 We saw no sign of alien aircraft, but did see a meteor explode and split in two! There was also a bright glow over the mountains to the south that could only be Las Vegas over 100 miles away. We finished off the drive the next day, even dipping into Arizona for a while before heading north again into Utah. We finally arrived at the trailhead the next day at 3:00 PM, where we met our friend that had stashed the water supplies. 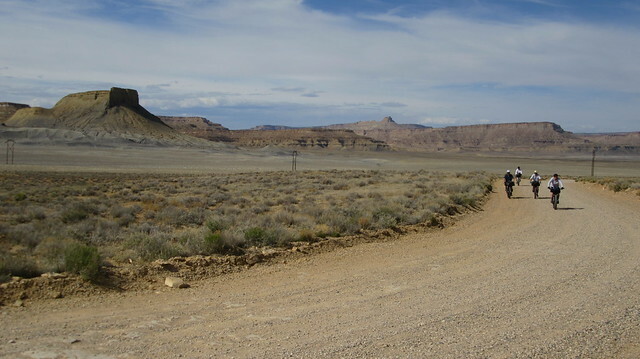 We parked just a ways in on Cottonwood Road, about 10 miles west of Big Water, UT. 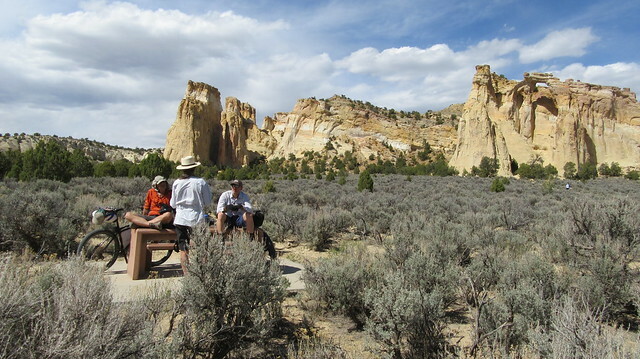 The plan was to finish the ride at the Big Water Visitors Center on Thursday, then get a ride back to the vehicles. 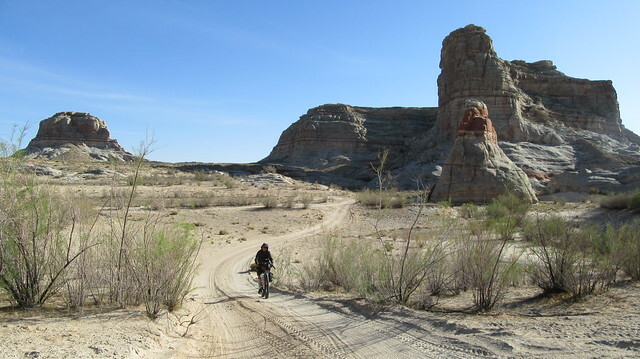 The official bikepacking route includes about 14 miles of dirt road between these locations, but with our late start, I was more than happy to cut out the mileage and over 1,000 feet of climbing! 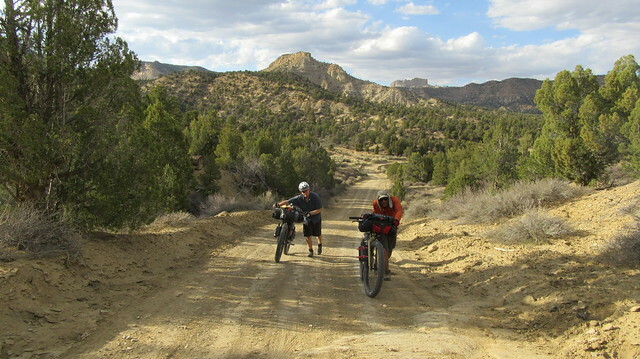 We estimated only about 14 miles of riding for the first day, hoping to camp somewhere near Lower Hackberry Canyon. 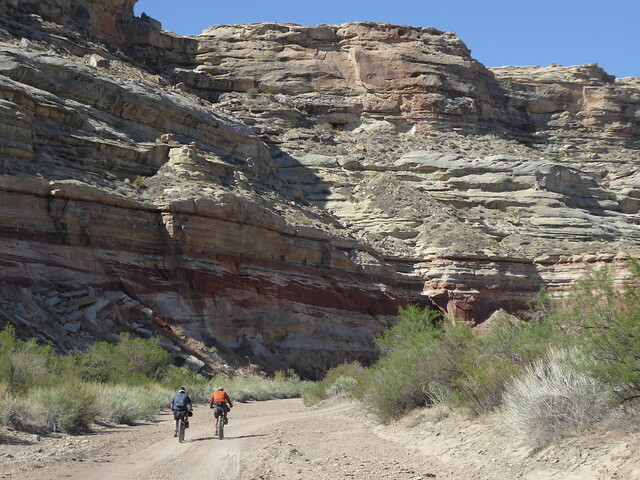 It was easy rolling downhill to the Paria River, then a gentle ride along the river canyon. 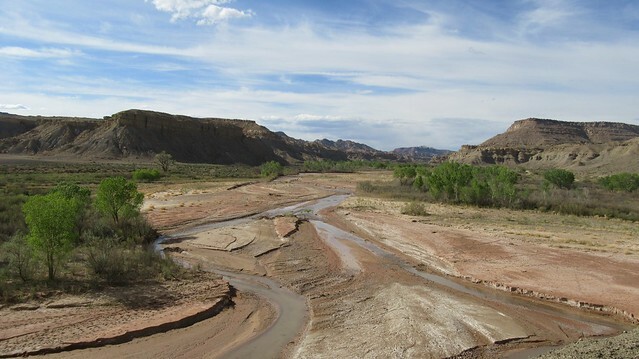 The Paria River is more of a creek, but there are signs that it can get pretty full when it rains. 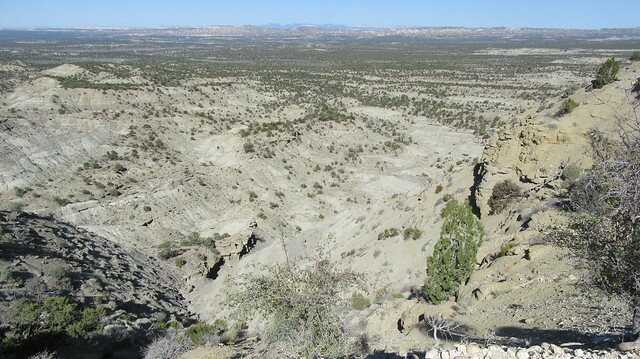 We lost phone service as we entered the canyon, my phone now just a camera and GPS. 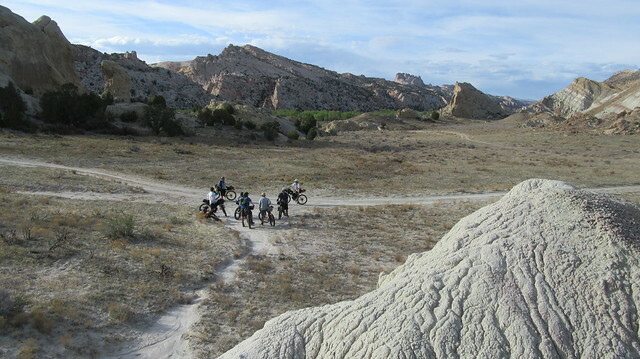 While we were looking for a campsite, we ran into a group of paleontologists that were hauling camping gear up into the hills to a fossil dig site. There are all sorts of amazing things hidden in this area. 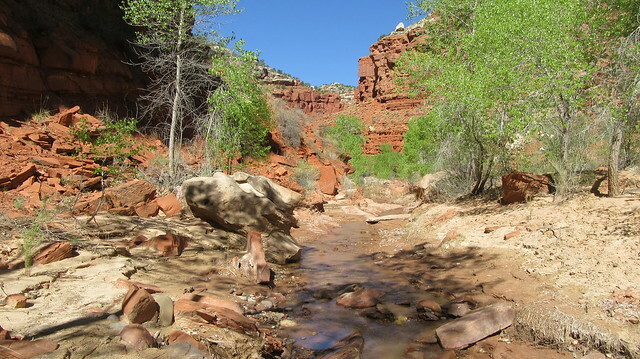 We found a great campsite near Lower Hackberry Canyon in a little cul-de-sac off the road above the river. It was a super easy day and a lazy night at camp. The warm 3.2% ABV Utah beer we hauled in for the first night wasn’t even that bad either. The following days would not be this easy. The second day actually started off with a hike. 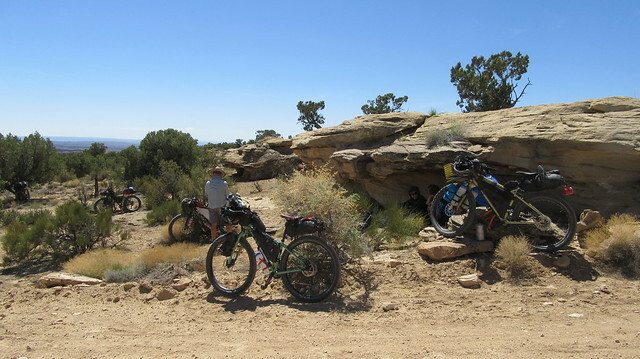 We packed up, then ditched the bikes near the entrance to Lower Hackberry Canyon. 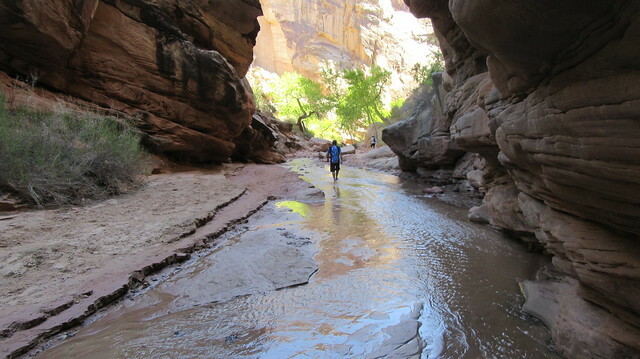 It becomes a slot canyon a short ways in, and the only way to hike it was by walking up the shallow creek. 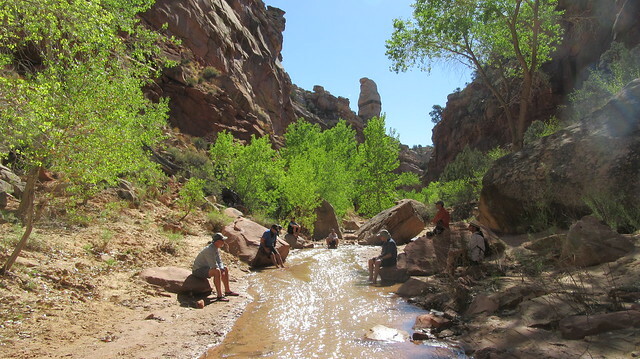 We spent a couple hours here, marveling at the towering canyon walls, and enjoying the tranquility of the creek as it bounced its way down the canyon. 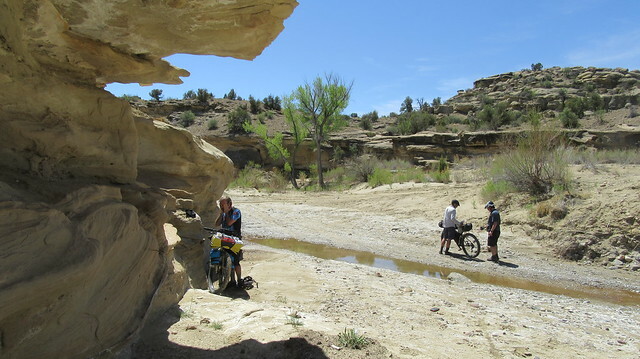 Nobody wanted to leave, but we had some miles to cover and it was warming up. 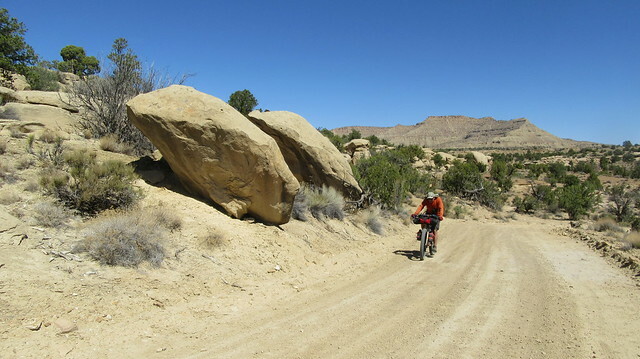 We continued our ride up Cottonwood Road through many interesting and constantly changing rock formations. 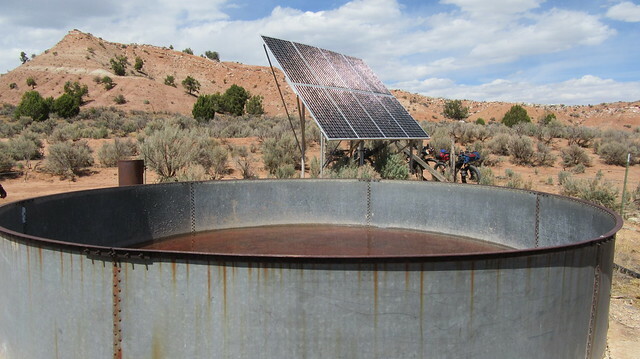 Eventually we made it to the turnoff to Grosvenor Arch, where we found one of the advertised water sources: An open tank with a solar panel that presumably powers the pump. The tank is fenced off to keep the livestock out, but still had several insect floaters. We periodically caught a whiff of something dead nearby when the wind shifted. We filtered a few bottles of water here before moving on to the arch. You take what you can get in the desert. 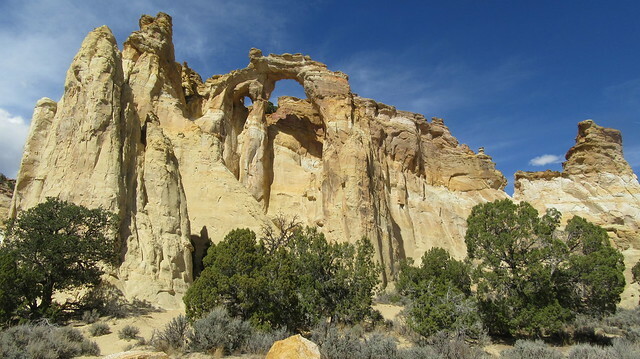 Grosvenor Arch is actually two arches, and the largest arch is nearly 100 feet in diameter. Towering 150 feet above the ground, their height makes them unique among most of the arches I’ve seen. We had a good rest here, and also inspected our first mechanical of the ride. One rider bent his small chain ring, rendering it useless. 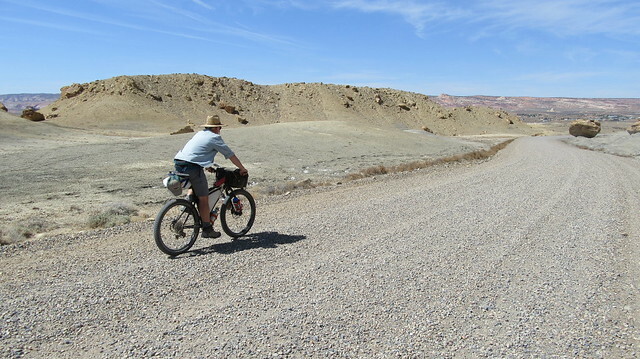 He wouldn’t have access to his lowest gears for the rest of the ride, and we really hadn’t even started climbing yet! 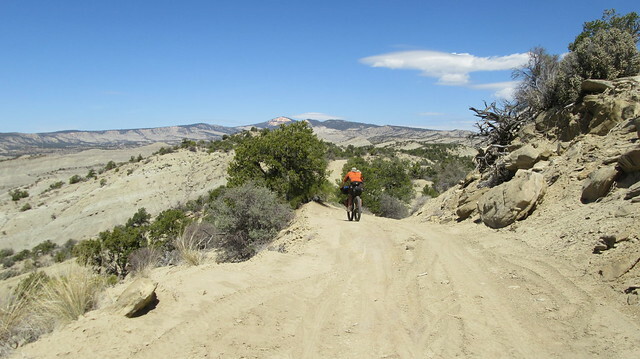 I may have bailed on the ride at this point and just took an extended camping trip back at Hackberry Canyon, but he said he was fine to press on. These guys are tough! We headed east from the arch, and crossed through The Cockscomb, the jagged ridge we’d been below for the last two days. According to the map, the pass is named, “The Gut”. 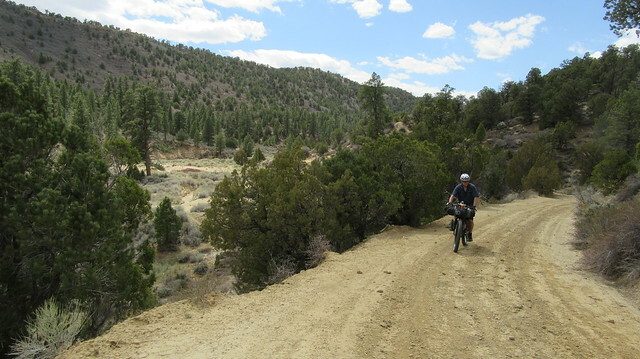 We were now in flatter country, riding through gentle rolling hills and dry washes. Near the end of the valley we came to the first water drop. Gallons of clean water! We all eagerly filled our bottles and drank water. The next water drop was a day’s ride from here. Without these two water drops, we would’ve had two days between the cattle tank and Last Chance Creek. We wouldn’t have made it. We were approaching Horse Mountain where we planned to head north and up the ridge. But first, the road headed south and dropped a lot of elevation instead. Flying downhill in the wrong direction felt really wrong and had me checking the map. 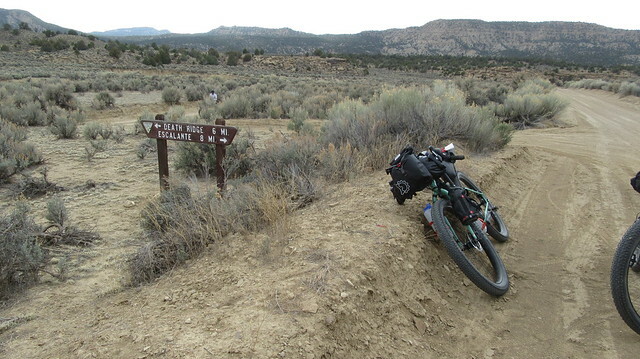 We finally got to a low point on Horse Mountain and had to push the bikes up a steep road to get up onto the ridge. 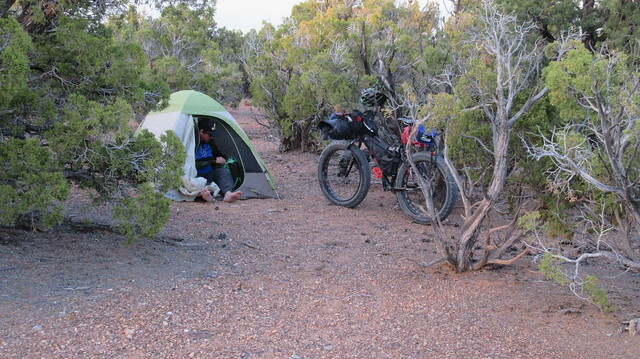 We rode just a mile or two north now before we found a nice camp in the junipers overlooking the valley we had just crossed. We had a few hours of fun social time that night before retiring for the night. I thought the day’s ride had been pretty tough, but I would learn the next day that I didn’t know what tough was yet. Maybe it was just the day’s fatigue, but I swore I heard Weird Al’s Living with a Hernia before drifting off to sleep. I could’ve loaded all my gear into a wheelbarrow and made the same progress. 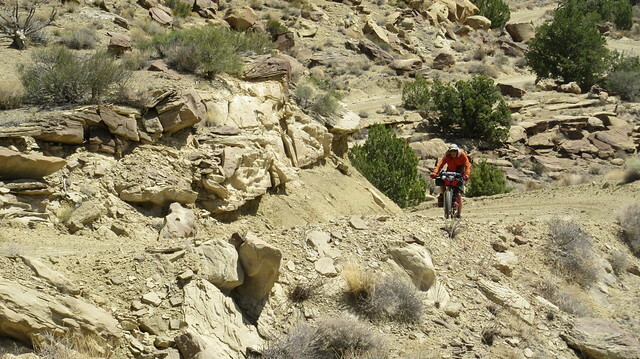 How could a top-heavy, 60 lb bike go 1 mile per hour and still stay upright? I had just two options: Keep going or lay down and die. Where else would I be right now? The office cubicle. This isn’t so bad. A few of us brought along blocks of cheese, as it keeps pretty well for a few days if it’s not too hot. I had two untouched cheese blocks in my pack, an Asiago and a cheddar, and they were the heaviest food items I brought. Looking to jettison some of this extra weight, impromptu cheese tasting parties would occasionally break out at the rest stops. Cutting boards were passed around. Tasting notes came from riders laying in the dirt or sitting up in the crook of a tree: “Fragile, but striking.” “Buttery and nutty.” “These cows were grass fed.” “Is that rosemary, or did you drop my cheese in the Juniper needles?” – Our new reality show, The Dirt-Bag Connoisseur. We pressed on to Death Ridge where the worst of the climbing stopped. As we crossed the ridge, we passed a place named, “Death Ridge Reservoir”. There was no sign of water here, just a patch of greenery where water may have once been earlier in the year. Another short climb and we were at the highest elevation of the ride! This was a huge mental milestone for me. 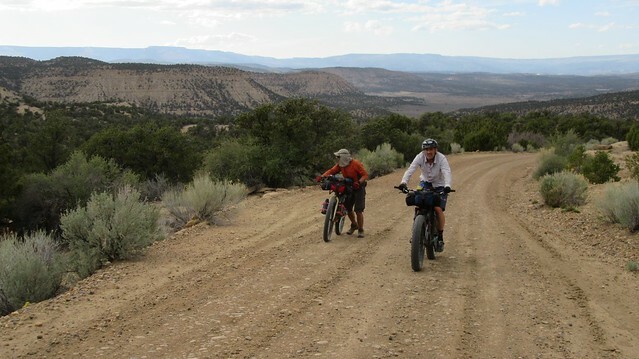 We started to rejoin the faster riders as we headed down towards Smoky Mountain Road. After several miles of blissful downhill, we came to the second water drop. Not a drop was wasted, and we didn’t even fill up to capacity. That last section had taken a toll on our water reserves. 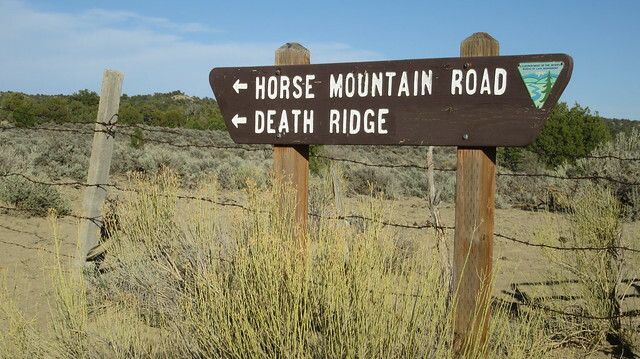 Goodbye, Death Ridge. Headed South. We reached Smoky Mountain Road at the northern most part of our loop. We were heading south now, another mental milestone. 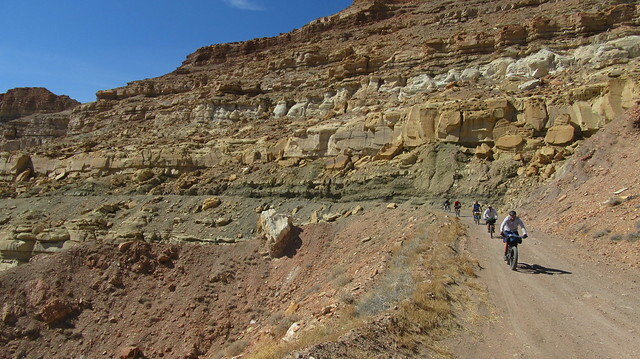 The elevation profile showed that we would be doing a lot more descending than climbing over the next two days as we made our way to Lake Powell. Looking at that graph, I imagined myself coasting for two days. I should’ve known better, though. When you look at a graph that is really zoomed out, those little blips on the computer screen are actually some pretty decent climbs when you actually get on the ground. 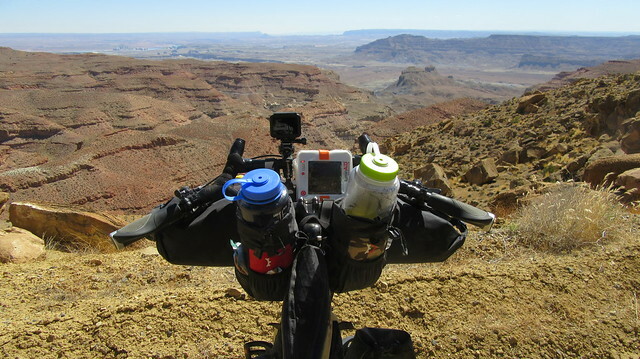 Although the riding had been hard this day, we hadn’t gained much distance yet. We still had to put in a lot of miles to lessen the next day’s mileage. 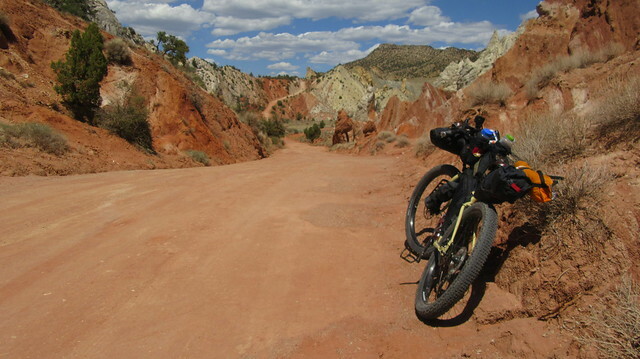 No matter how many miles we could get in before dark, we would still have to ride even further the next day. Long climbs and long downhills followed. Difficult with tired legs, but nothing like Horse Mountain Road. We passed Camp Spring. There were puddles here, although I’m not sure if they were from a recent rain storm or had bubbled out of the ground. Also obviously a popular place with cattle. We didn’t stop. 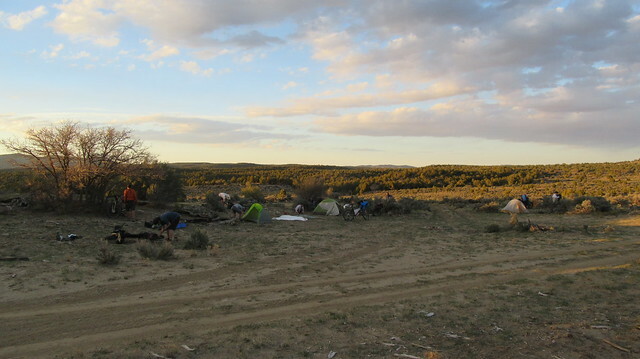 We finally setup camp in a high meadow as the sun was going down. 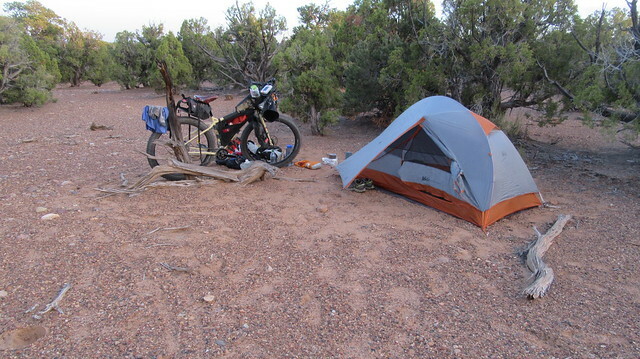 Grass everywhere, and barely a rock to be found to pound in a tent stake. Funny, because I had seen nothing but rocks all day long. Social time was limited to cooking dinner, and people started retiring for the evening before I had even finished my beans and rice. We had an early start on the fourth day. 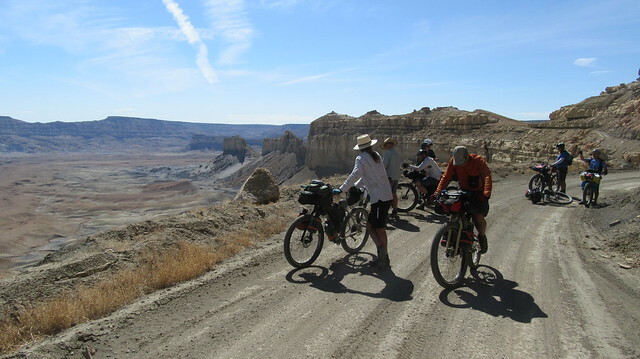 There were over 50 miles to ride to get to Lake Powell, but everyone was in good spirits and looking forward to getting to the lake. We had a few short climbs to deal with at first, but then had some nice stretches where we could easily pedal the bike for miles. It felt good to make progress! 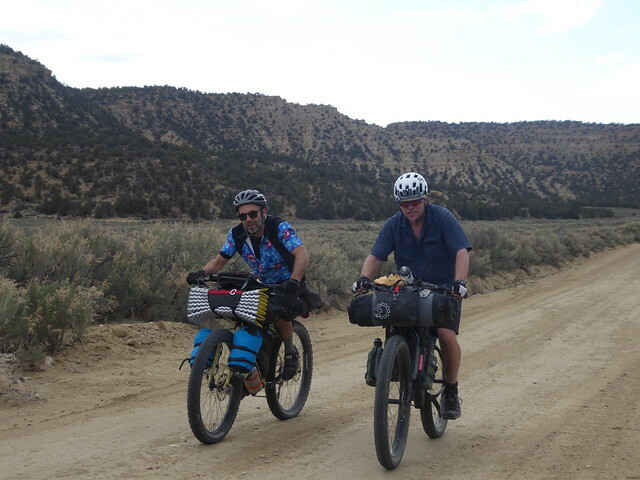 We passed a couple bikepackers breaking camp and doing the same route as us. 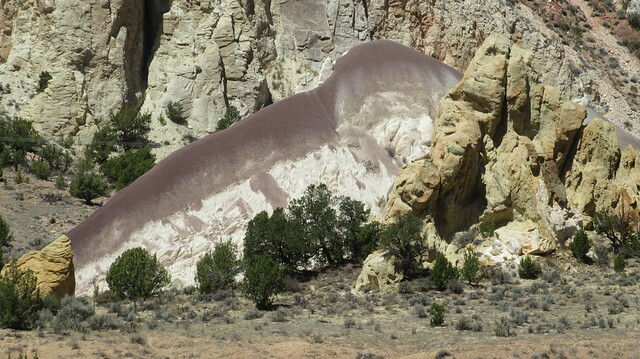 They had started in Escalante, and planned to finish through Horse Mountain/Death Ridge. We started to drop elevation. 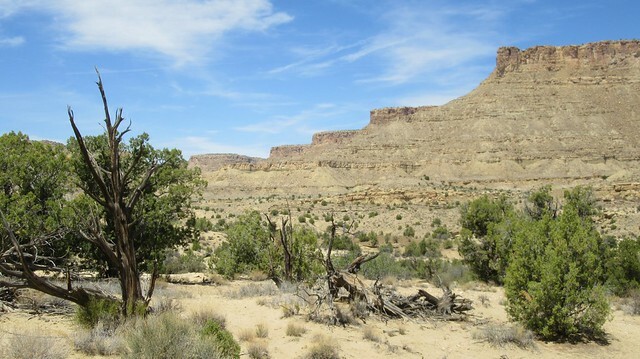 The trees thinned and the desert grew around us. 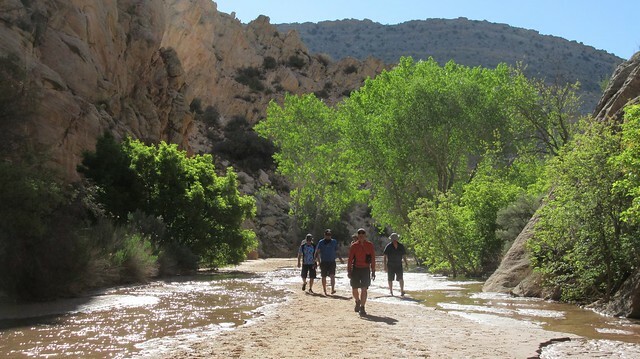 We passed a lot of beautiful canyons that begged to be explored, but there wasn’t time for leisurely walkabouts this day. 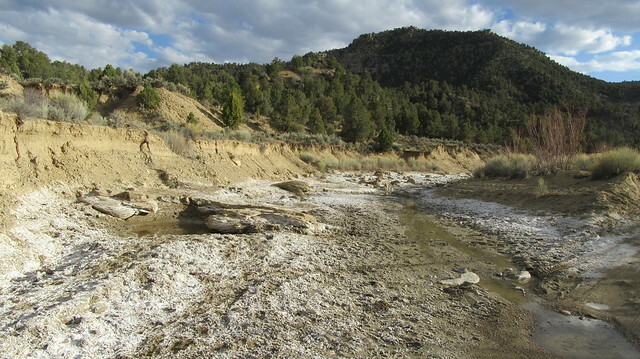 As we approached Last Chance Creek, I worried that it may have dried up. I had expected to see more people driving this route, but Smoky Mountain Road sees a lot less traffic than Cottonwood Road. People had offered us water back on that road when we didn’t need it. What would we do if we ran out of water? 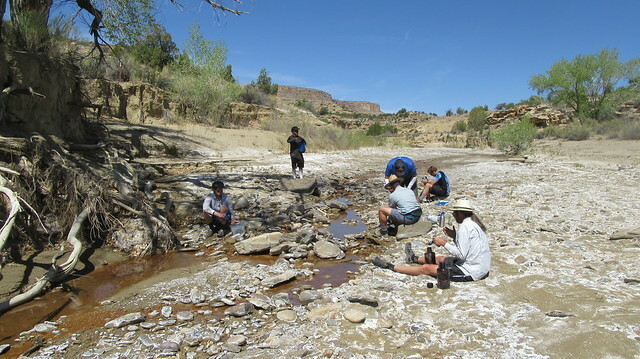 When I finally got to Last Chance Creek, the faster guys were already there filtering water. We’re saved! The creek was barely flowing and had mostly dried up. We had a water assembly line going. Two guys scooped up water in collapsible buckets and filled the squeeze bags. Water was squeezed and filtered through Sawyer Filters, then distributed to clean bottles. I brought along an ultraviolet sterilizer too, but the battery was dead (false reading on my battery tester at home!). Just had to have faith in the filters. The water was cool. The water tasted the same way a field full of cattle smells. I took nearly 6 liters of it. A staircase. But not THE staircase. Naturally, after adding 15 pounds of water to my bike, it was time to do a few big climbs. I was getting pretty good at pushing my bike at this point. Thankfully I had lots of water to drink on the way. Big gulps followed by a shudder when the taste hit me. Later, one of the guys would give me an electrolyte tablet that added a little flavoring to the water. This made a huge difference! Make a note of this. 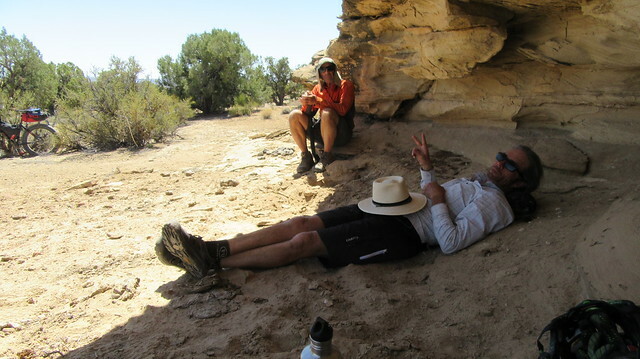 An hour and a half later I caught up to the fast guys where they were taking naps under a big rock. It was like the old Tortoise and the Hare fable, but the lesson learned was that there are rewards for being fast. We got to a really long straight road that climbed up to the horizon. 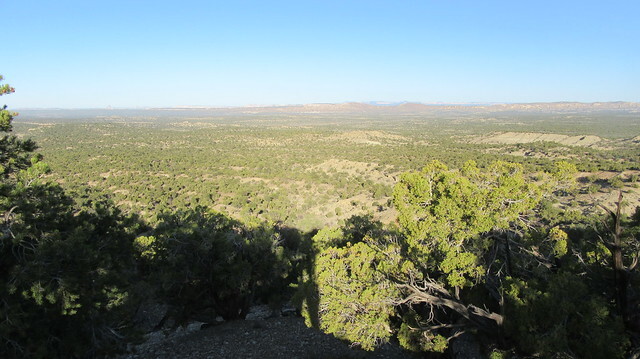 We couldn’t see it from our vantage point, but we were slowly climbing up a big mesa. Each small hill I made it up revealed another hill, until finally, we were at the south edge looking down. 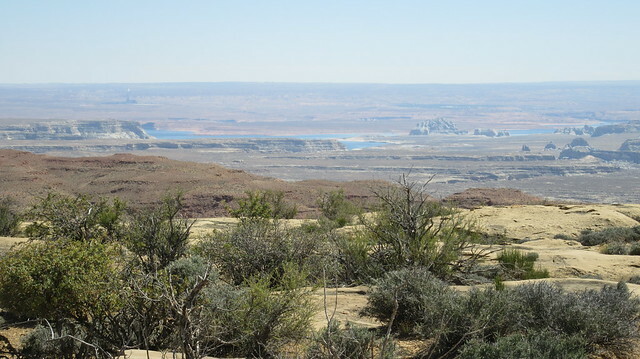 Far below, and about 8 miles in the distance was Lake Powell! A twisty downhill snaked its way down the cliffs below us. I suddenly felt rejuvenated. 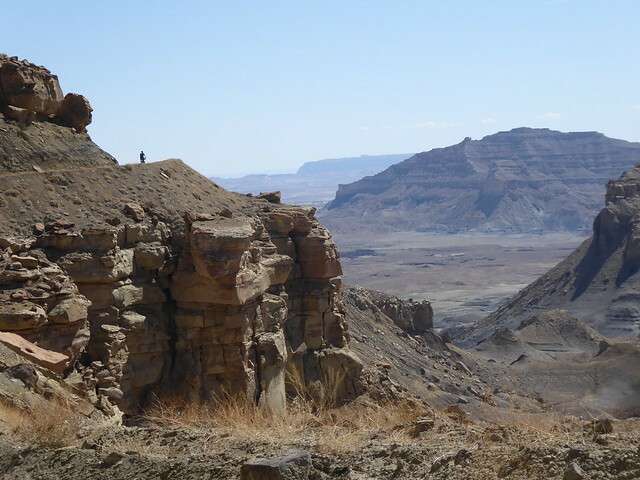 We could’ve made great time going down the cliff-side road, but there were so many great viewpoints that required stopping at. 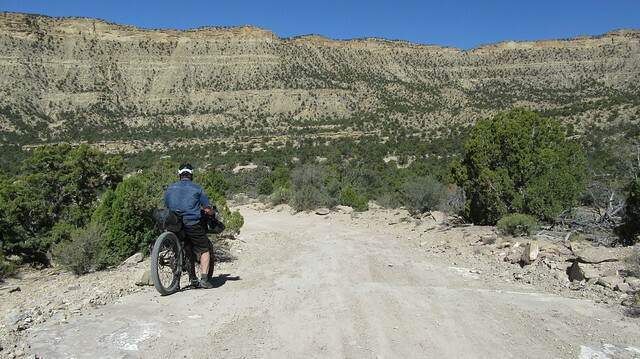 The road felt plenty wide on a bicycle, but I wouldn’t want to drive it. 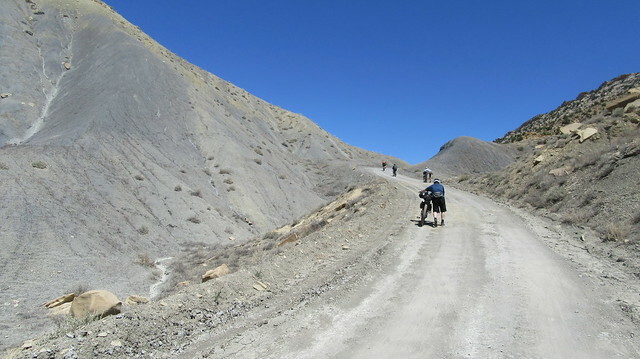 There were a few really steep sections, and it was obvious why it is recommended to ride this route clockwise like we had done. I had definitely burned some brake pads by the bottom! At the bottom we had some more rolling terrain to deal with. With tired legs, it took all I had left to get through it. 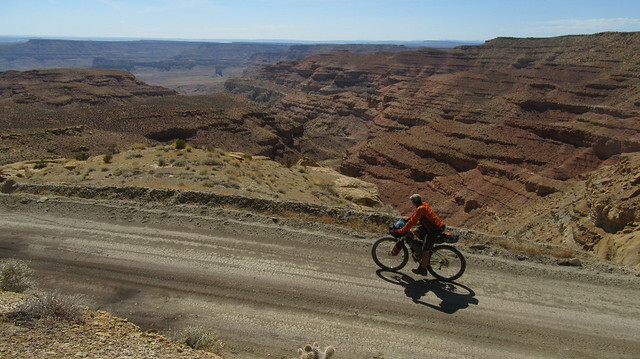 Finally we turned down Crosby Canyon, the last leg of the journey to Lake Powell. 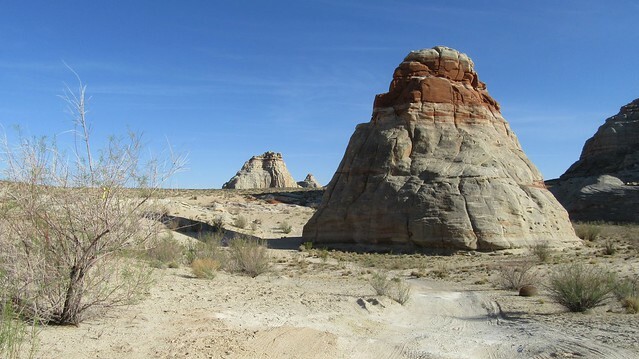 The road here winds gently down through a slot canyon with all sorts of odd rock formations. It helped take my mind of the fatigue. 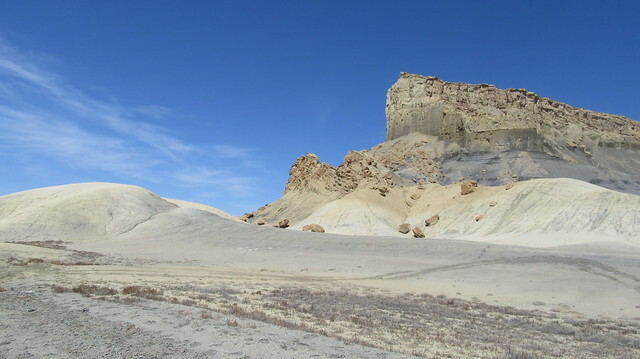 After exiting the canyon, colorful towers of rock as big as buildings rose out of the desert floor. My instincts said we should’ve already arrived at the lake, so I checked my GPS. The map showed that I was in the middle of the water! The water has receded a lot since this map was made. Roads went off in several directions, so it took some exploring to find where the current lake shore was. There was no discussion as we pulled up to the beach. Everyone had the exact same thing on their mind. 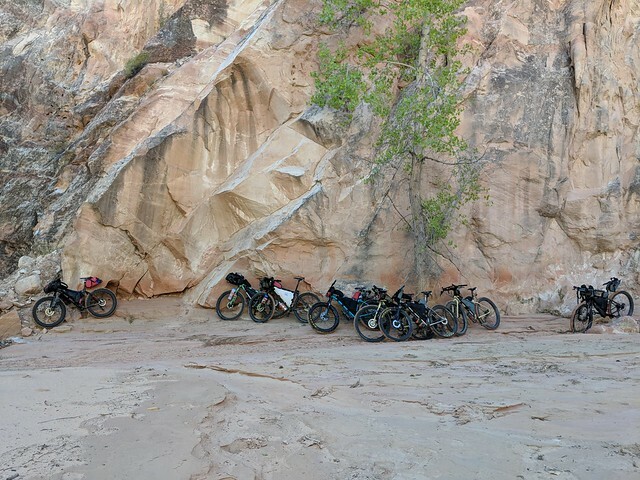 Bikes were dropped in the sand, and everyone immediately headed for the water to jump in for the closest thing to a bath we’d had in five days! The water was cold and deep, both cleansing and refreshing. 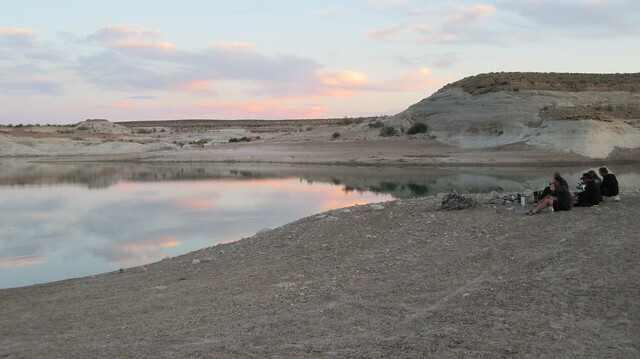 Afterward, it was decided that any water filtered from the lake should be taken up-shore of this location. Lake-view dining followed. 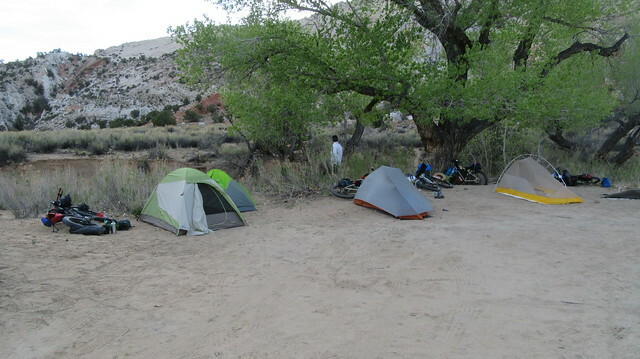 This was my favorite camp of the ride. It was warm and bug free, so I didn’t even bother with the tent. In the middle of the night, I had a dream about a bunch of kids screaming and yelling in someone’s backyard. I woke up and realized there were coyotes howling all around us! 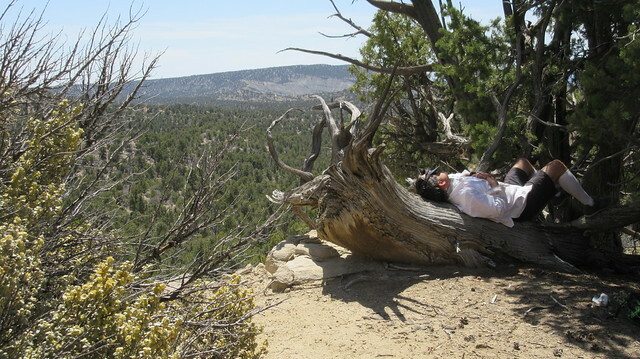 I enjoyed a view of the stars and fell back to sleep. Where the heck is that lake? 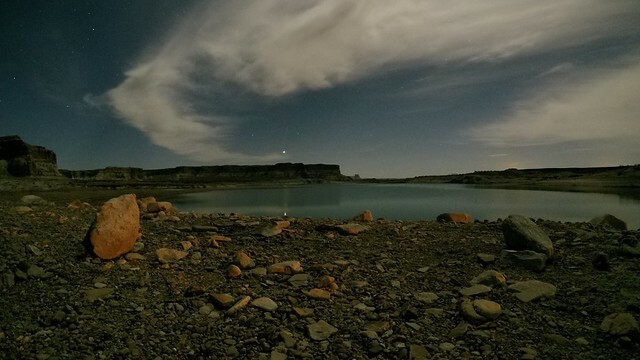 Arriving at Lake Powell. Time for a swim! 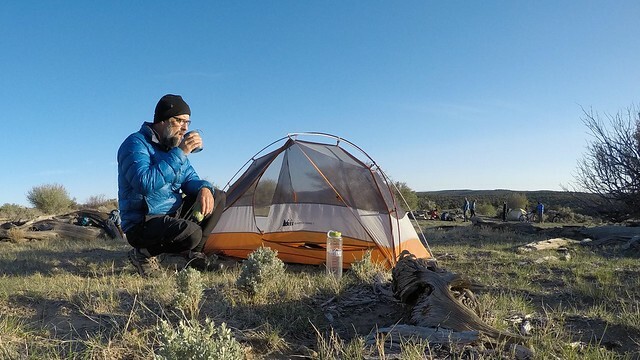 Camp 4 – Easiest camp setup of the trip! 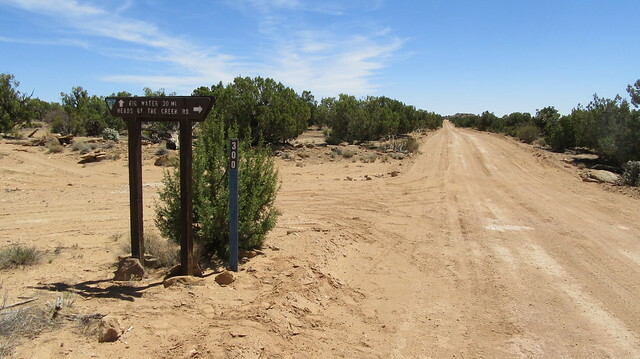 It was time for the final push to the Big Water Visitor Center, just 14 miles away. 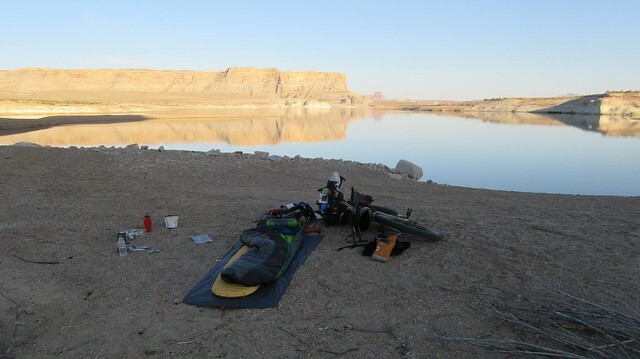 I exchanged some Last Chance Creek water for some Lake Powell water. The guys said it tasted better, but I think I was getting used to it now and lost track of which bottle was which now anyhow. I wouldn’t have to drink it much longer. 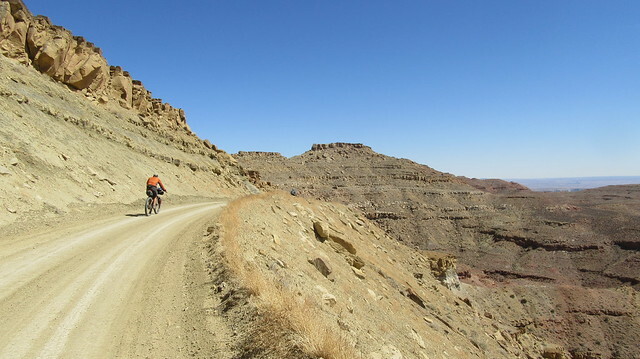 The pedal up the scenic Crosby Canyon was not bad at all with its gentle grade. 10 miles to go now. 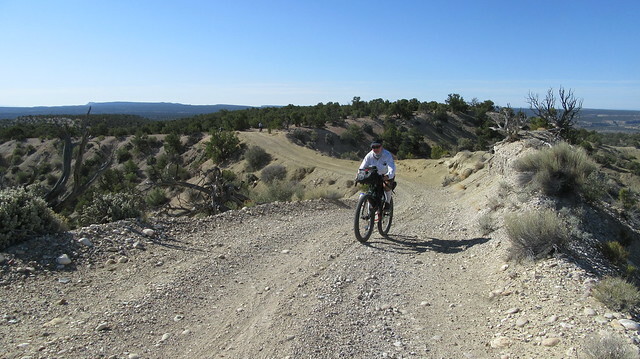 There were a few nice downhills that gave us some free miles. 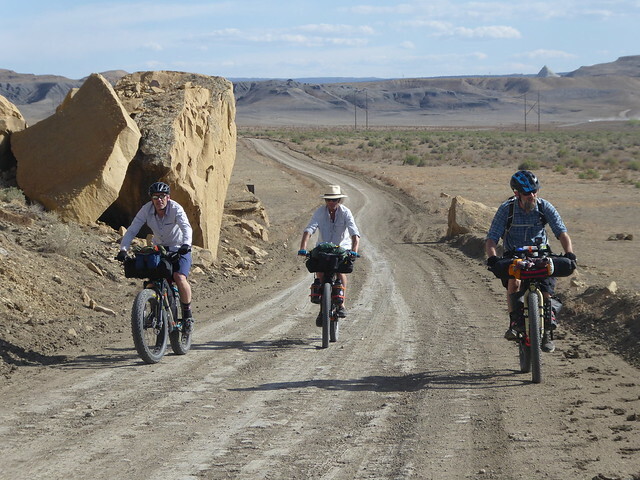 In the last four miles, though, a thick gravel covered the road. The kind of gravel you might see in a runaway truck ramp. So close now, but progress was slowed down to a crawl. We could see Big Water. Road signs said this was the “improved” section, but it was the worst on the bike so far! 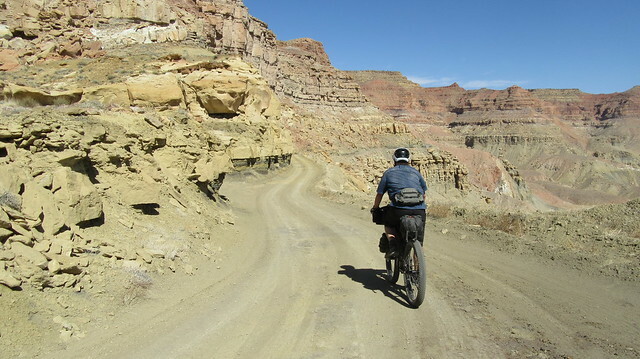 The gravel gave way to asphalt, and we were flying again, but then the road dived into a canyon with a really steep climb up the other side! Oh well, one more walk wouldn’t kill me. The last half mile to the Visitors Center was easy. When I pulled into the shade structure out back, everyone was already unpacking clean clothes and refilling water bottles with delicious clean water. One of the rider’s parents would be conveniently passing through in the next hour to help shuttle us back to the trailhead to pick up the trucks. 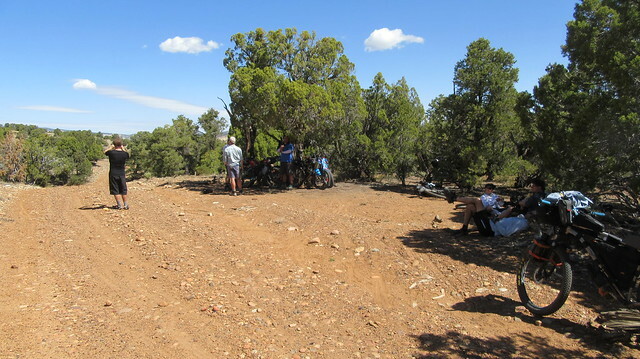 Nobody wanted to ride the last 10 miles up the hill, and all were happy to just rest in the shade. Big Water visible. 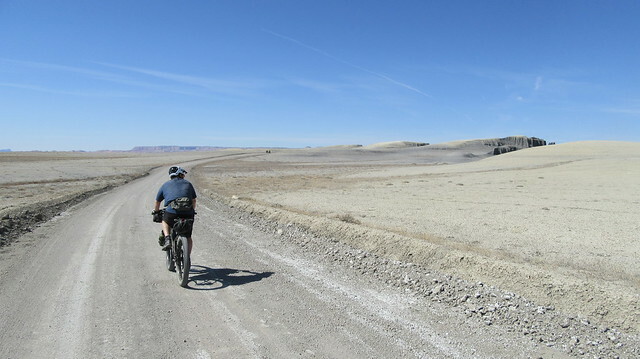 Lots of slow gravel. Our new touring cyclist friend from France! The shuttle driver arrived and they had beer! I knew it was going to taste good, but I was unprepared for just how good. It also felt wonderful to guzzle all the water I wanted without rationing. After a wet paper towel “bath” in the restroom and some fresh clothes from my pack, I was feeling pretty OK. 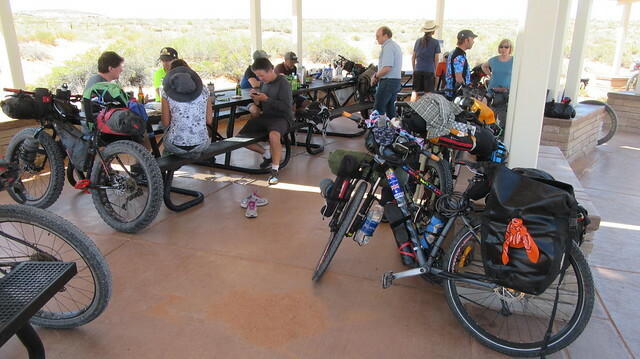 Joining us for a beer in the shade was a touring cyclist from France. 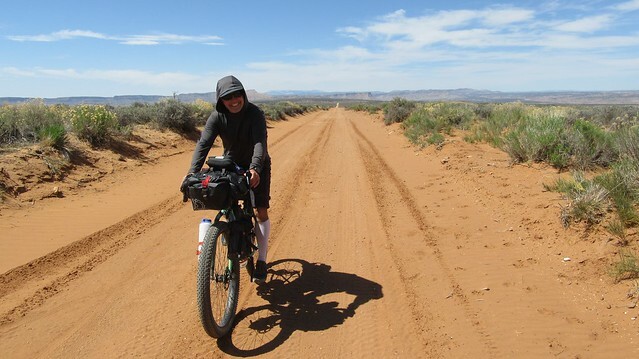 She’s been touring the world by bike, and had previously been in Australia. 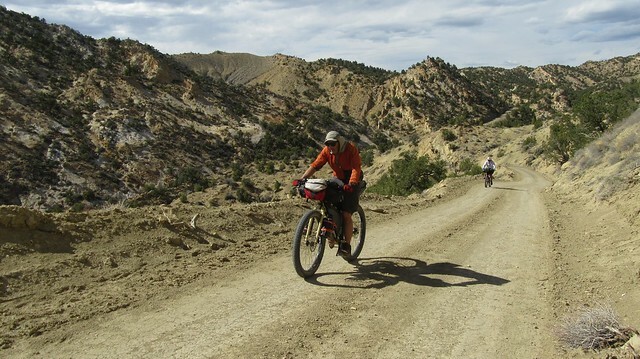 She told us about her recent adventures riding through Death Valley. We taught her some American Slang. Overall, it was an amazing trip through some spectacular country. Although there were times during the ride when I didn’t think so. I knew, though, that these times of suffering would turn to fond memories after it was all over and some time had passed. “Type II Fun“, some people call it. 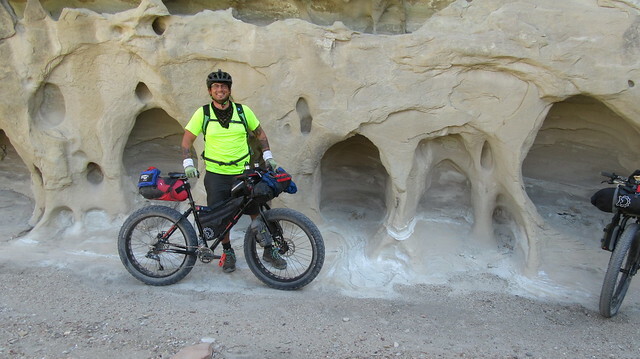 The ride mentally raised the bar for me on what I can accomplish, so I will be more confident going into future multi-day adventure rides. 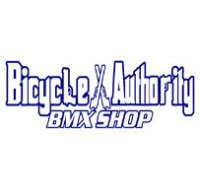 As far as bikes go, most of us were on “Plus Bikes”, running 3″ wide tires on either 27.5″ or 29″ wheels. 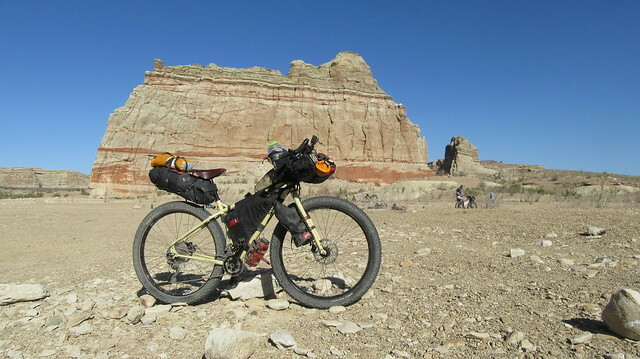 These bikes turned out to be great for bikepacking, a good mix of flotation, lighter rolling resistance, and comfort. 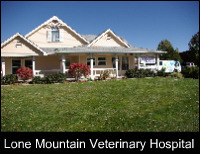 Only minor injuries were reported, and the broken chain ring was the only major mechanical. Not bad for so much riding. 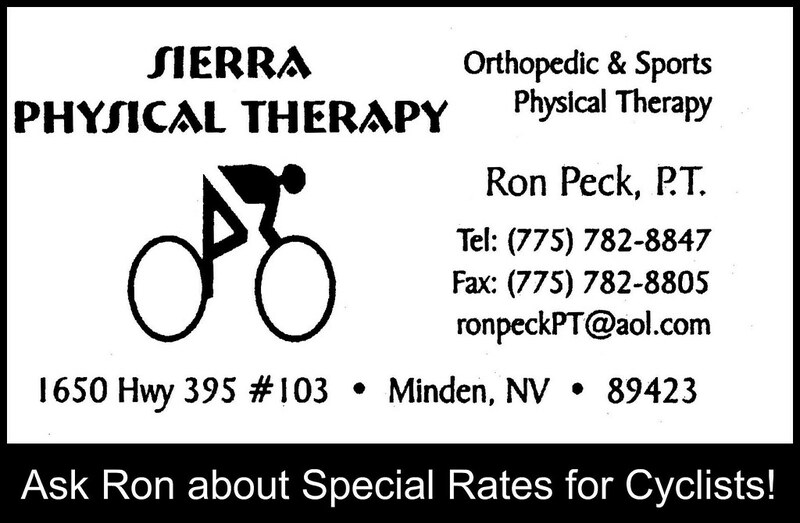 We finally loaded up the bikes and headed back to Carson City. 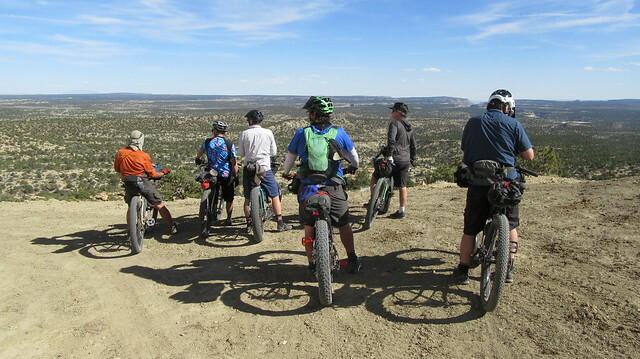 But not before heading to Gooseberry Mesa for more riding and camping! Showers would have to wait a few more days.